I'm not going to lie. 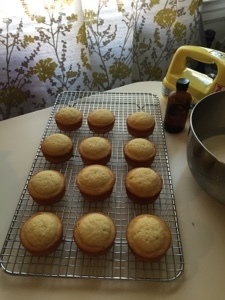 I prefer to the baking assembly these days to the knitting kind where you have all those pieces you have to stick together and get the seam right. I am going seamless whenever I can for garments these days and I'm OK with it. But my knitting is slow. Just a few stitches here and there, just enough to keep a complete level of insanity away, but not enough to post or show. Soon my dearests, soon. 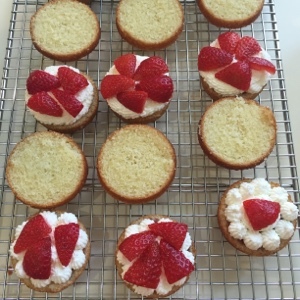 So back in the kitchen I've been going full-blown Great British Bake Off, Anglophile these days. 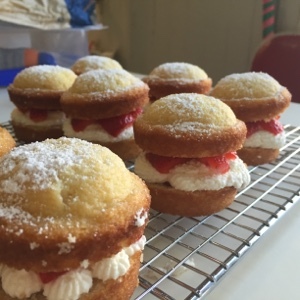 These are some mini victoria sponge cakes by the Great Mary Berry. I love her bubble gum colored outfits and the way she talks about cake. I modified it just a bit, just because. I ran out of strawberry jam that was NOT from her recipe, because quite frankly, I didn't have time. I used my friend Lady H's homemade plum preserve. I spread a tiny bit of that down directly on the cake and then piped down the heavy whipping cream, instead of drizzling jam over double cream. I also used a bit of confectioner's sugar in the cream. 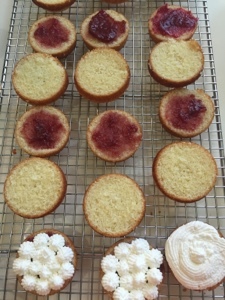 I think it helped stiffen up the cream but also just a little sweet to cut the tartness of the plum jam. I then put on a few thin slices of fresh fruit (because I grew up in California and it's what we do) and ma voila! 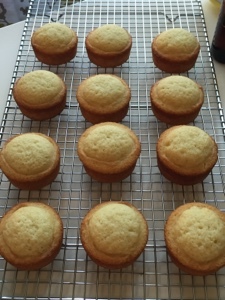 These cakes are different than regular yellow cake just by the texture in my opinion. I'm not sure why but they are really delightful. Slightly crispy exterior for me (maybe the amount of butter I used in my tins) but still springy to the touch. 15 minute bake. Fabulous. I got the "spool" cake pan at Joann's when I was out killing time (and emptying out my wallet) with Mom last week while she was visiting. That place is dangerous for both of us for different but multiple reasons.